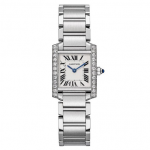 Cartier Tank watch was born in 1917 and was designed by Joseph. The appearance concept is derived from the parallel section of the French RENAULT tank. And the tank crawler evolved into the bar on the side of the case. Roman numerals, track scale rim, blue pomme pointer, diamond crown and leather strap. A masterpiece of the combination of war and aesthetics products has become the standard for the development of Tank wristwatch in the future. 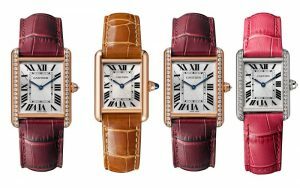 Tank series is the top model of Cartier, and is also a modern interpretation of square and rectangular watch. What’s more, the circular line of Tank series is the first to foretell the aesthetic rules of artistic style, and its geometric design is the modern standard of aesthetics. With the arrival of the 20th century, Louis Cartier, who had a profound classical culture and loved collection, boldly explored the jewelry art design vocabulary and new artistic style. In the early 20th century, the exploration of wristwatch design mainly focused on modeling. Its aim is to integrate round shape into the lines of the strap. Reducing the complexity of the surface and making the case and the strap fit together. The beauty of the Tank watch is not divided. Its shape that is like the golden ratio of creation subtly blends profiles of square and rectangle. In addition, the free spirit and elegant style presented by the Tank watch have no gender identity. It’s also popular with both men and women. It transcends gender and age difference. And with the right proportion to reveal the modern style. For Gary Cooper, Andy Warhol, Madonna Ciccone and Catherine Deneuve, Tank wristwatch was seen as an unspoken fashion icon. Moreover, in the movie, The Son of the Sheik, Rudolf Valentino worn a Tank watch all the time. Even Diana, the princess of Wales, liked to wear the Tank watch. 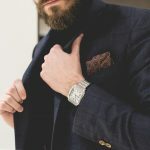 For anyone who advocate the spirit of freedom in every era, Tank watch is undoubtedly the embodiment of taste and grace, which connects the past and present. And four classic works that lead the modern lifestyle are as follows: Tank Louis Cartier watch, Tank Américaine watch, Tank Française watch and Tank Cintrée watch. 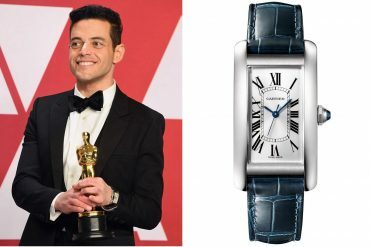 As we all know, Tank Louis Cartier watch was released in 1922. And it symbolizes the true spirit of Tank. 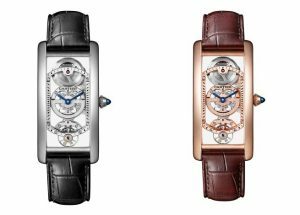 With the neat lines that are perpendicular to the lugs, rounded edges and the integrated lugs plus case, Tank Louis Cartier watch has been tested for many years with its iconic design. The striking shape and the unique style display the pure and enduring charm of the watch. And, Tank Française watch is equipped with the steel bracelet. The curved case and the watch bracelet are integrated perfectly. Its lines, shapes and materials are harmonious. And the geometric design becomes more softer and striking. 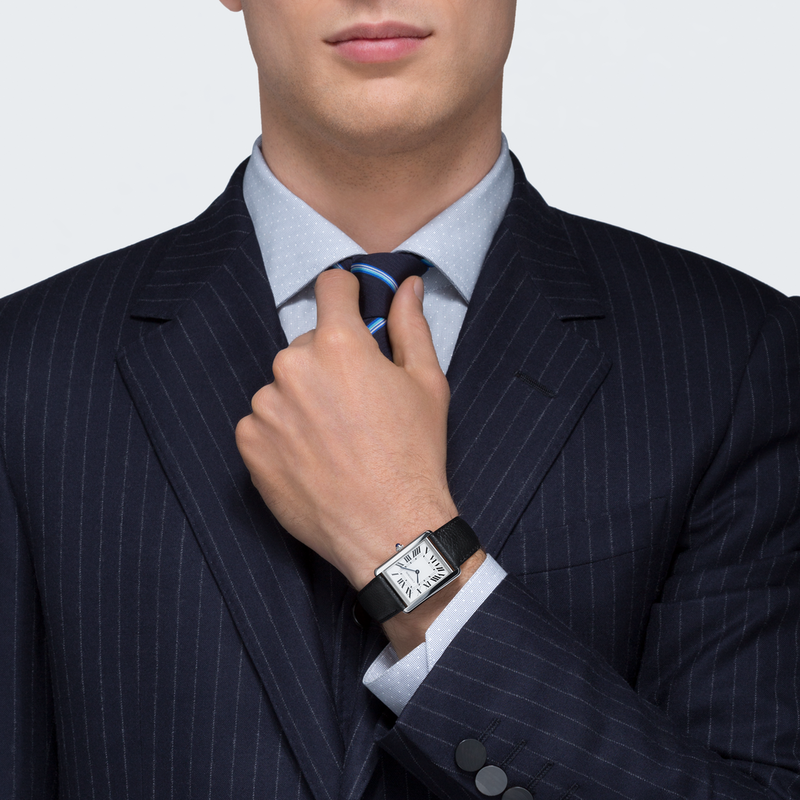 The details of the watchmaking process highlight the whole line of the watch. Now, this watch with the practical function and unique style combines the steel material with bright diamonds well. More, Tank Américaine watch was designed in 1987 and was officially launched in 1989. Its curved case continued the design concept of Tank Cintrée wristwatch in 1921. The extended line and the slightly curved shape make the wristwatch strong and enduring. The Tank Américaine wristwatch gives a full play to the watchmaking process and geometric aesthetics. Handsome and elegant features, straight line and curve, round and the corners, all these are cleverly blended into the one. In addition, it is also the first Cartier watch with the waterproof function. Last, Tank Cintrée watch was a bold exploration of functionality and style. 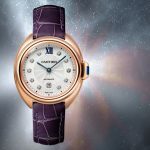 And it set the stage for the launch of the Tank Américaine watch wristwatch in the 1980s. The vertical extension line is strong and powerful, and is the frame of the overall shape. 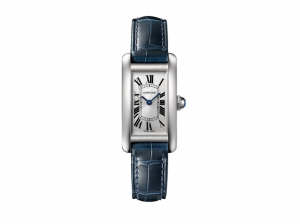 With this masterpiece, Cartier reveals its remarkable ability of watchmaking. It is equipped with a hollow movement that is designed for curved case. Through the simple design, only the classic elements are revealed. So, the unforgettable aesthetic style is combined with the unique and extraordinary machine movement. And it can be called the masterpiece of art. All in all, the Tank series with the ultimate essence of modern style is a triumph of pure elegance and eternal design. For many of its enthusiasts, Tank watch is a symbol of life. Because, they avoid luxurious boasts and prefer the simple and authentic elegance.